My school, Sinarmas World Academy has started on a huge publishing project called Write Now 1000. The aim is to publish 1000 books over the next 7 months! If you want to read up about this project - take a look here Write Now 1000. I am proud that this project is a direct result of a Publishing Project sandbox that I led from January to May, 2012. 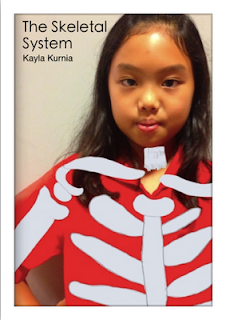 I worked with several students to create and publish iBooks to the Apple iBookstore. This resulted in the publishing of 10 books, some were written by students and some were written by me. As well as the 10 that were published to the iBookstore, there were about 70 other books created by students that were published to the school website. In my own current class of Grade 4 students, I have been working with the class to write non-fiction books about the latest Unit of Inquiry. Each student has written their own book on their iPad. We used the app called Book Creator for iPad. I have witnessed the awesome difference when you put publishing in the hands of students. My students are each creating a resource that will be available for download across the world. This is authentic learning at its' best. My students have a voice. The books that they are creating are giving them a platform to share their work as a finished product. Writing a book is a very different experience to writing on a website or blog. The book is created as a finished product - it becomes an artifact. Writing a book is a fantastic way to make connections in learning and to reflect on learning. 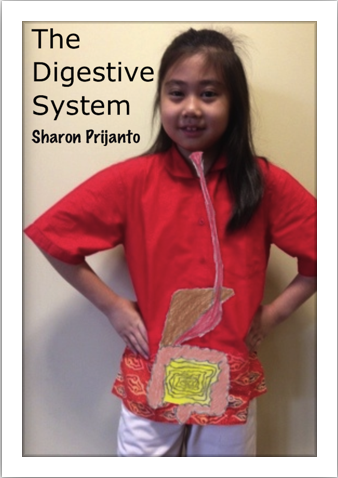 Each book in my class has been research-based, includes student created photos, videos, voice recordings and hand-drawn diagrams. The students have learned about cover design, contents page, how to cite information, layout, font, color, relating pictures to text, creating accurate diagrams and how to put it all into a sequence from the beginning to the end of the book. I am witnessing some deep thinking and there is such an excitement about the books. I am constantly seeking different ways for students to communicate their learning. I use a LOT of visual learning. In these books the students had to really demonstrate their understanding of their chosen body system by creating diagrams to go along with their text. Each student wrote an explanation about a body system and an information report about a focus part of that body system. To go beyond the text, each student had to draw accurate diagrams to accompany their words. They also had to create a movie showing an experiment or demonstration that linked to the body system. As well as this they also took their iPads home and took pictures showing how they can actively keep their body system healthy at home. iPads are so great for this. They are easy to use, capture is so immediate and creating dynamic digital inter-actives is very easy to do. It changes the whole way we think about learning. So much of education is text based. 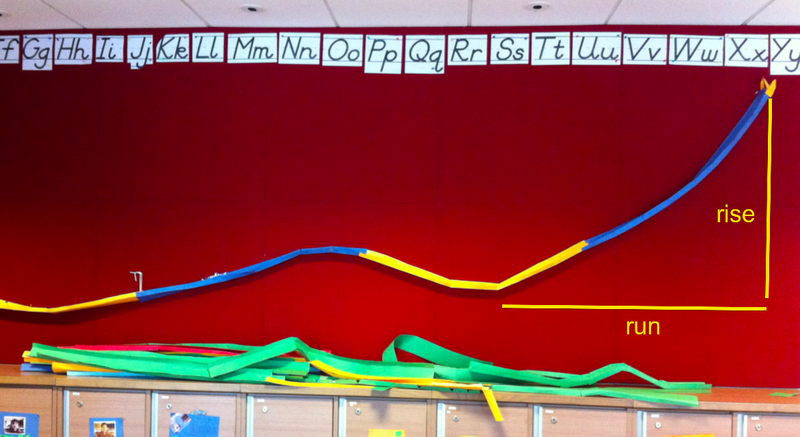 I love being able to create opportunities for my students to communicate visually. Recently my class had the opportunity to share their books with a younger class. They were so excited to show their books and talk about the body system that they had researched. Each of these books averages at about 35 pages. It's become a very big task but a very interesting one. Mind you I have read the books many, many times to check for spelling, grammar, factual text, that the facts have been reported correctly and information cited properly. I also have to check the quality of the images (not blurry and connects well to the text), that the font is consistent and easy to read. I also check that the layout is balanced. Even that a good contrast between text and page color has been achieved. My students are fortunate that they also have access to Ms Ade (Indonesian teacher with Science background) and Mr Lindsay (our grade level EAL teacher) who can check their writing and give valuable input. Like I said, it is a BIG process but then again we are really publishing these books and putting them online. 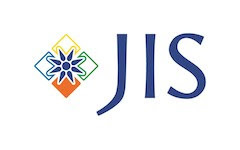 The system that I use is as these children are under 13 years old, I invite the parents to come to school where I help them to set up the iTunes and iTunes Connect accounts. This means that the parent becomes the publisher and has full control over the book accounts. Here below are two of the books that I have already uploaded to the Apple iBookstore. All the information in the books has been written by the students themselves and all the images and movies have been created by them as well. My students are 9 years old but I have taught them a simple referencing style with author, year, book title and page number. This week I hope to upload some more books to the iBookstore. Every book created in my class will go to the School Bookstore as a part of the Write Now 1000 project. It's such an exciting process. The parents are really excited too and I look forward to blogging about the books after Apple has approved them. This year I am back in the classroom full-time. I have been the Technology Coach at my school for the past four years and felt that I was getting too removed from teaching as a homeroom teacher. Last year I was back in the class part time but I really needed to go back in full time so that I could have the full responsibility for the class. Homeroom teachers are very busy people. There is so much to juggle but at the same time it is all about setting routines and sticking to them. Sometimes I do well and sometimes it's very hard. I am constantly struggling with keeping a balance, hitting all my goals and keeping it on track. I also work as a part of a team which can be very hard as we are all busy, all have commitments and all have different teaching styles and opinions. I love being able to connect with the students again. I am getting to know them more and more everyday and starting to see some progress. What I love is seeing how the whole writing process has gotten so much easier. At the start of the year I was lucky to get a few sentences from each student. Now most of my class can write in greater detail and much more quickly. I am even getting some consistency with paragraphing. I am very proud of my students' most recent work which was to each write a digital book on a body system. They created these books on their iPads. Each student has written a book which is research based, includes a video, voice recordings, hand-drawn diagrams and photos that were taken by the students themselves. I have uploaded the first two books already to the Apple iBookstore and we now wait for them to be published. This week I hope to upload three more. Writing books is a very big process, especially when the books are research-based. I have proof-read these books over and over and over and yet I still find small errors. I have had to check each fact to make sure that the students have not changed the meaning when writing it into their own words. I have also had to check that they cited the resource correctly. I will write about this process in more depth in the next blog post. In Math we started with a geometry unit which was fun and very practical. The following unit was measurement which has shown me how many students needed some explicit teaching but - now we are past that and into the final stretch. The upcoming unit is number which is proving to be more challenging. I have started some PD on my own which has already taught me so much. A colleague of mine put me onto this resource - NZ Numeracy Project. I have started to diagnose my class through a series of personal interviews. Wow! I am learning so much. It does take a long time to get through each one but I feel that learning about how my students actually think when working with numbers is invaluable. Differentiation is hard. I have a typical class which as you know has students who can work easily and those who struggle. There are learning needs in the mix that are really challenging me. I can ability group and I do but sometimes it is hard to work with groups that have such a great need for explicit teaching. I try hard to give personal attention to each student but often my focus will drift to those who have the greatest needs. I strive to give ample focus to the top students as they deserve attention too. Ohhh it's such a balancing act!! I often feel quite frustrated but this just makes me like it all the more. Teaching is the hardest job I know and that's exactly why I do it. Now that I have settled into this year, I feel that the hard work is just about to begin and I look forward to the challenge. Yes - I gave back the MacBooks! Why? I have always been interested in the 'What if?'. When I first began to use iPads in classrooms (just after they had been released), I always wondered what it would be like to use iPads in a 1:1 environment instead of MacBooks. I had only ever used iPads as an extra tool not as the 'go to' tool. I had always run back to using the MacBooks because that was how I knew how to do things. I wondered - what would it be like to just use iPads only? I got the chance to do this for a couple months about 2 years ago. I did a small 1:1 program with K2 students. At that time I was the Technology Coach and only worked in that classroom once a week. The program ran for only 3 months and just as we were getting into it, the school year ended. This year I am back in the classroom full time as the homeroom teacher. I felt that this was my chance to really put the iPads through their paces and see what could be done. I am writing this after about 3 weeks of using iPads in my class. Yes, there are things that work and things that don't work. There is good and bad. So many teachers expect technology to be able to 'do it all'. I'm not one of those people. I have no problem accepting that there are things that I cannot do. The difference here is there are so many MORE things that I can do BETTER with iPads. Ok, I have a typical class. There are the high achievers, the middle and the strugglers. iPads can help me differentiate so well. 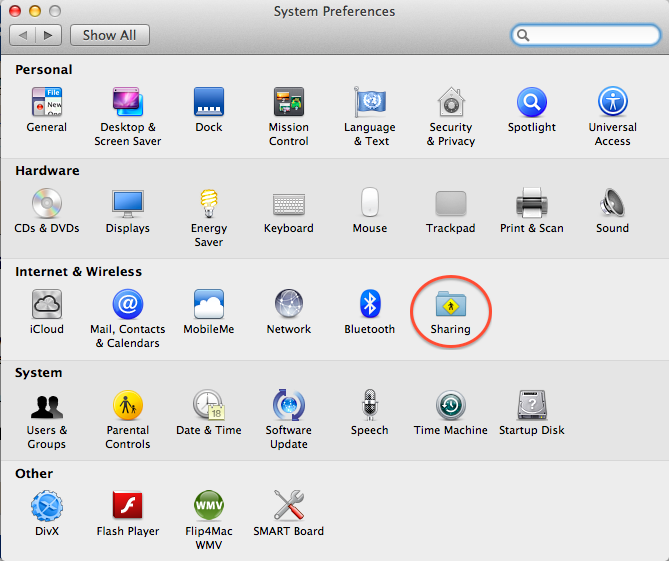 It's easy to put different apps on different machines to cater to the learner. Ok, maybe this is not really a word, but the iPads work a little like using instant noodles - or IndoMie as we call it in Indonesia. It looks up the word, it speaks the word all in the same screen just by a simple tap. In most apps you can take photos right inside the app. I particularly like the WP Blog app and being able to photograph and post 'on the fly'. Oh - and if you want to undo your typing - just shake the iPad. Yes, our students love to multi-task but that can compromise their concentration on the task at hand. On an iPad, you can only really do one thing at a time. This is a good thing for younger learners. The range of apps are fantastic! I can customize the learning as needed with apps that are right on target. Many apps that I use are even free ones. On a MacBook I am limited to the image put on by school. That image generally doesn't change for the whole year. iPads are light and easy to carry. They can be taken to wherever the learning is. I can use the iPads on one full charge for a few days. Not bad considering that I use the iPads a lot!! Wow - this makes capturing photos or film so easy! If you have learners that require the iPad to speak in different languages - you can customize it just to do that. The iPad can read books in iBooks in 36 different languages. Wow - just wow! Ok, so what doesn't it do? Yes, transferring work can get sticky - especially videos. Of course there are 'work arounds' and you do need to be a little more organized to get the job done. It's essential to have a setup where students can easily push their work to somewhere else. In my class we use blogs which helps with that. Some of the work is pushed to a dropbox too. That's fine - a small price to pay. I know that a lot of you reading this post will be thinking of things that iPads can't do. The reality is that some schools don't have the funds to opt into MacBooks. 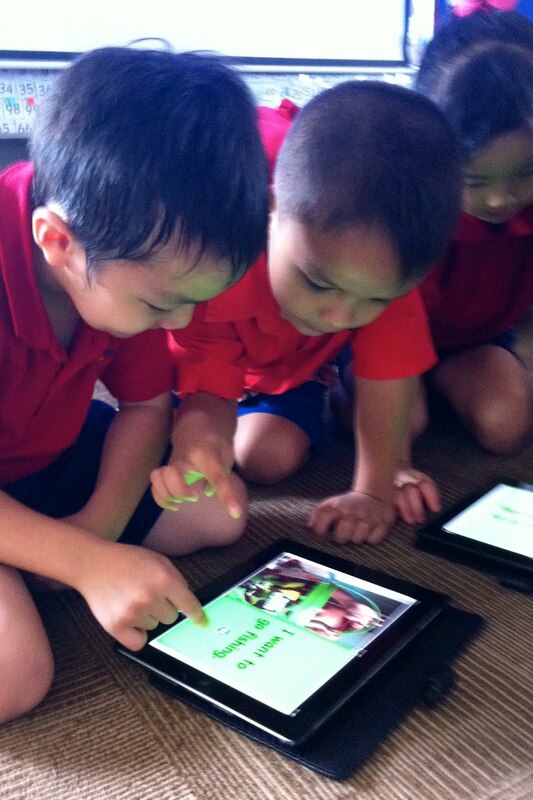 In Indonesia many schools are seriously considering opting into iPads. I want to encourage that. The more we can make the student learning experience more personalized the better!! How can teachers support students to create books and publish them? Yesterday I helped to upload the 9th book from SWA to the iBookstore. This book was created by my own daughter so I can explain each step here for those of you who may wish to publish a book. This seems simple enough yet it can be the hardest part of the process. 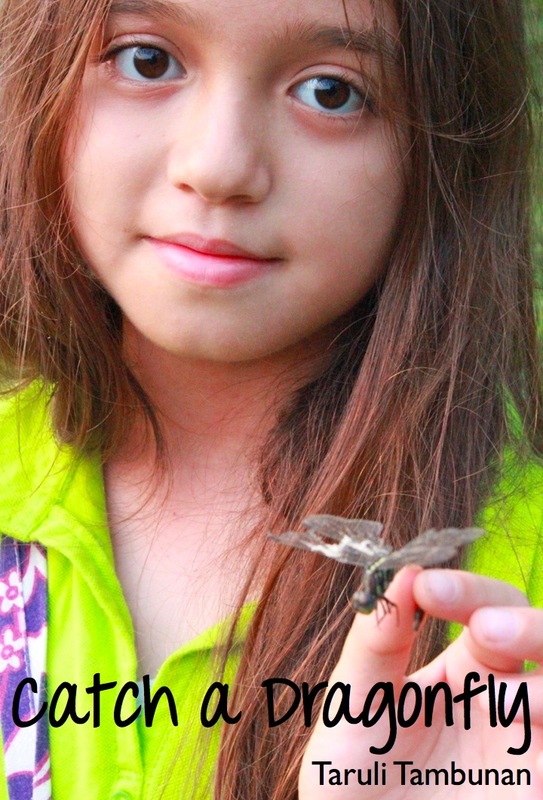 Luli, my daughter loves nature and we were chatting about when she first learned how to catch a dragonfly. Luli is a very caring girl and only likes to catch the dragonflies to take a closer look. She then releases them again to fly away free. We chatted about how she could turn this into a story book. When making a book with children, it's best to keep it simple. Luli and I went for a drive to find a rice field. We found a few but we needed the rice plants to be tall and almost ready for harvest. This is what attracts the dragonflies. We also needed to go late in the day when it is cooler. I asked Luli to think about what needed to be included in the book. I took the photos so that Luli could concentrate on the story. 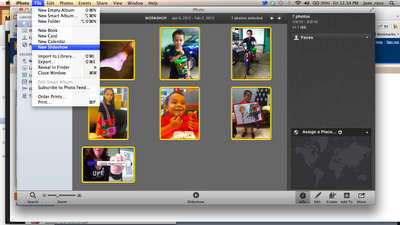 I downloaded all the pictures onto my Macbook and Luli chose which ones she wanted to include to tell the story. She then put them into order and we imported them onto my iPad. It is very easy to create picture books directly on the iPad. 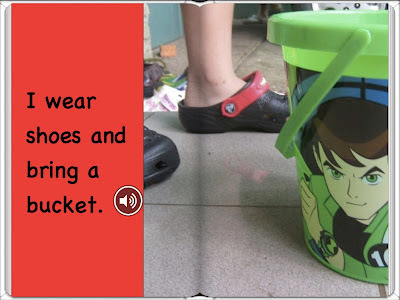 This allows children to focus more on the story because learning to use the App only takes a few minutes. We used the Book Creator app for iPad to make the story. I really like the professional finish that Book Creator produces. Luli was easily able to insert all the pictures into the book and type in the text to go with each page. We decided to use a lot of double page images to really show off the photos. Book Creator allows for an easy preview in the iBooks free app. You just tap the export to iBooks button which automatically opens the iBooks app and opens your new book. After previewing her book, Luli was able to change the order of some of the pages and then preview again by clicking export to iBooks. 6. Recording the book reading. Luli wanted to include a recording on each page of her reading the book. This is so that her book can be more accessible for younger readers. 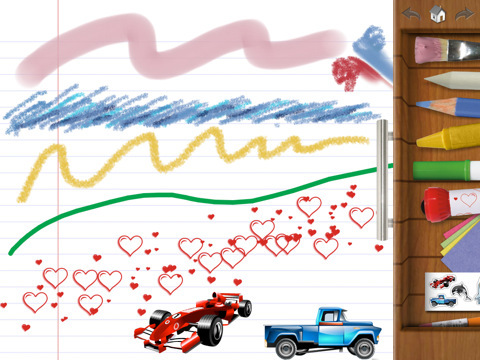 She did this easily using the Book Creator app by separately recording each page. She was careful to read slowly and clearly. 7. Exporting the finished book. When the story was complete. Luli added one last page 'About the Author'. I insist on all my students including a page about the author. I think that it is important for the reader to know who wrote the book. 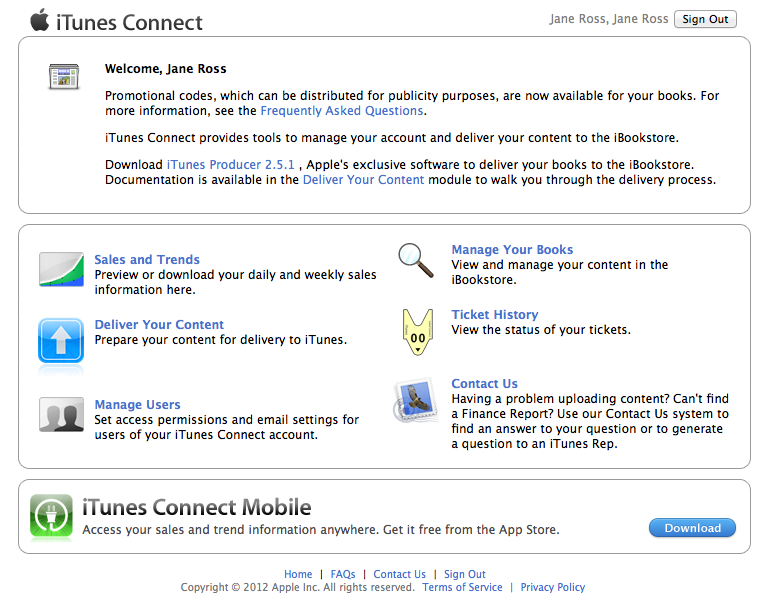 To upload the book to the iBookstore, you need to have the parent create an iTunes account (with a credit card on file) and then an iTunes Connect account. To create a Paid account you need many things such as a US Tax file number, ISBN for each book and also complete tax requirements for the country in which you reside. 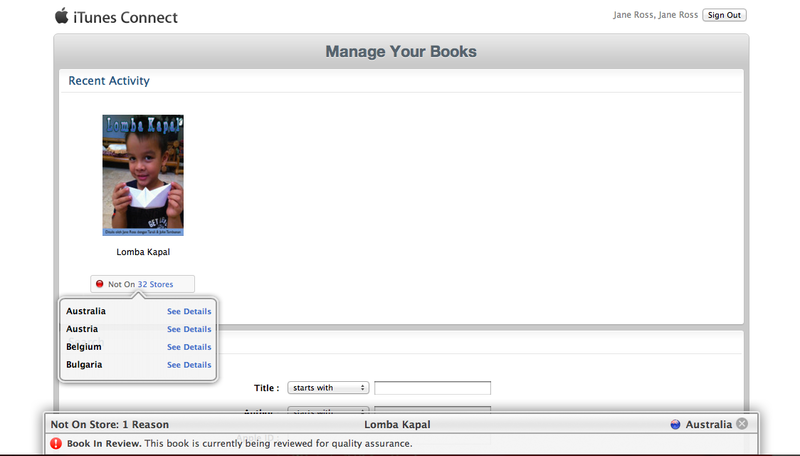 For students I recommend creating a Free account as it is instant and the iBookstore supply each ISBN for free. If the child is under age, the parent must be the one creating these accounts as the parent will become the publisher for the child. Once the account has been created, any subsequent books can be easily published via that same account. I had already created an iTunes Connect, so it was easy for me to upload this book to my account. 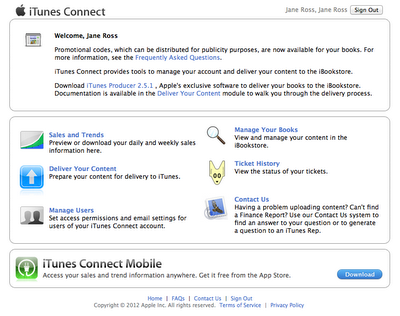 It is important to read the instructions that are inside the iTunes Connect account as to what requirements are necessary for your book. There is a limit on images used for publishing to the iBookstore. Each image must be less than 2 million pixels. I needed to reduce the size of all of the photos for Luli's book as I had taken them with a DSLR and they were 10 MB each. To do that you can open each photo on your Macbook using Preview and in the Tools section reduce the size for each image. In the publishing package you will need to include a category for your book, title, description and target audience. You will also need the exported ePub file, cover image and some sample pages. The sample pages must be 1024 X 768 pixels which is easy enough to re size using Preview on a Mac. The iBookstore will run several checks on your book. In my experience, if the images are under 2 million pixels, there is little more to worry about as Book Creator produces a file that is standards compliant with the iBookstore requirements. 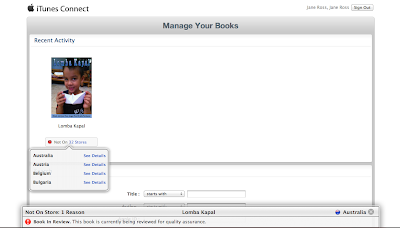 The iBookstore does check the content which can mean delays in publishing. My daughters book that I uploaded yesterday at 6pm was published only 6 hours later! This depends on your content. Not all books are released that quickly. Some books produced by my students have taken as long as 6 weeks to publish. Good luck to you who wish to publish. My daughter is so happy today. She is already planning book 2!! 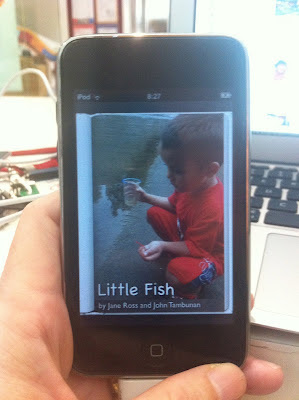 eBook Little Fish Hits 3,000 Downloads! 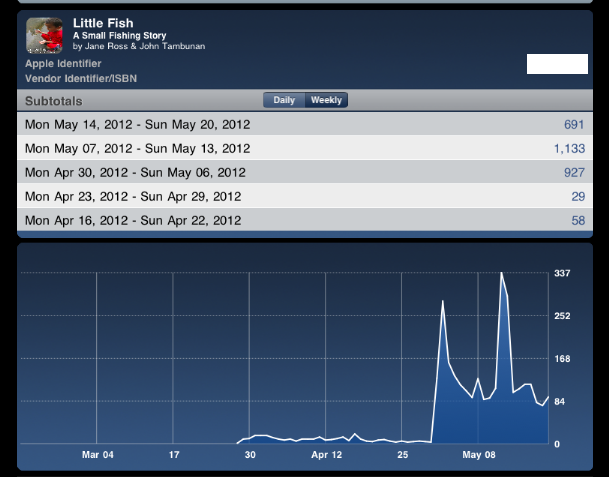 The success of Little Fish the eBook has been quite staggering. I first made this book with my son, John about a year ago in a printed version. John came home one day from playing to show me a tiny fish that he had caught from a river in the housing complex that we live in. He had so much to tell me about this fish and I encouraged him to take me to the river to show me where he caught it. I took my iPhone to take photos and John rode his bike. I asked John to tell me the story as we went and I took photos to be later put into the book. We downloaded the photos onto my Macbook and I put the story together using the program called Keynote. John was able to retell the story easily. We put a sentence for each photo keeping the story simple yet engaging. Originally we wrote the story in Indonesian as John had only just turned 5 at the time and his English wasn't very fluent. Later I translated it into English. The result was then printed onto paper and I took it to a book binder to put a hard cover on it. John was able to share his book with his class but that's as far as it went. I have been making books such as these for years here in Indonesia. 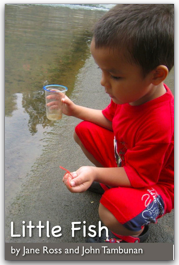 Simple stories that can be printed up and hard bound for classroom use. It is very difficult to publish a book here in Indonesia. Most publishers will only print 3000 and so therefore will only choose books that have the potential to sell well. 'Little Fish' was well received by John's class and we kept a copy at home on our bookshelf. At that time there were no apps for creating books which allowed the user to have control over the layout. I have always used a simple layout style featuring large photos and simple text. I have preferred to use a landscape page orientation for picture books as I can make the picture really fill the page. A few months ago I learned about an app on the iPad called Book Creator. I read that it can produce a file that is compliant with the requirements for the iBookstore. 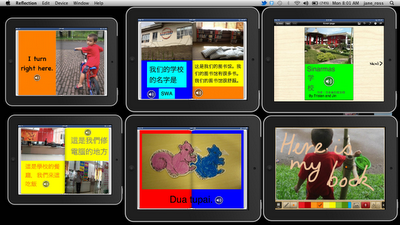 I started to use the app in different classes to produce books but I had not thought of publishing any of them. I decided that I needed a test product so I quickly revised 'Little Fish' making it in English only and adding voice recordings to make it more engaging. I uploaded the book to iTunes Connect and set about getting it published. I have already written about that experience in a post here. It is amazing to think that people can now share their stories in this way. My son's book is regularly featured by Apple in the iBookstore alongside professional authors such as Beatrix Potter. John gets feedback about his book from people on the other side of the world. The difference here is this book has gone through the same system that other authors experience - yet it was made by ordinary people. I know I keep saying this but this is the beginnings of the publishing revolution. 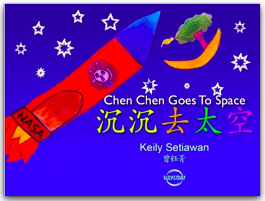 It's been a few days since the news broke about my 9 year old student, Keily Setiawan the youngest student to self publish a book in English and Chinese to the Apple iTunes iBookstore. The reaction to the news has been quite amazing. We held a press conference at my school last Friday, 11th May to announce Keily's book that she had published with my help and under her mother's authority. To date the news has been posted in many, many different publications both online and print. These articles have been generated about the story so far. I was most excited to see the news posted by Apple in their iTunes News section on their website. We teach students to write in every school but their audience is usually limited to their teacher, their peers and their parents. We are seeing the beginnings of a publishing revolution. Kids can now write for a world wide audience. 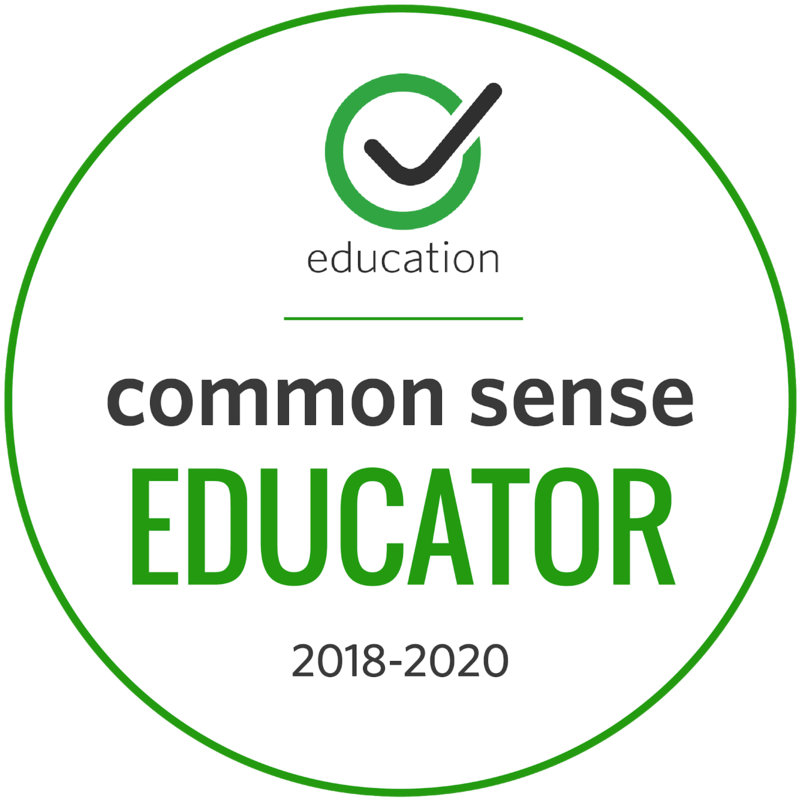 Now we are putting tools into the students hands that can empower them to share their knowledge, their experiences and their learning in a whole new way. "I am witnessing my students completely re-think the way they present their learning. It's gone beyond just fulfilling the expectations of a teacher, to how they can present their work so it will engage an audience that they have never met. It's more than posting online to a blog. The tools that the students have access to when creating a book for the iPad change the whole way they think about presenting their work. It's beyond words and pictures - it becomes engaging and along with that students need to rethink everything." Keily (9 yrs) used a storytelling style to present her book by working hard on her voice recordings to give more life to her story. She wanted to show how well she can speak in Chinese in her book 'Chen Chen Goes to Space'. "It's different when you know kids in America can access your book. I love to read the comments on the iBookstore about my book" - Keily. John (6 yrs) wanted to tell his fishing story and show everyone how he is now able to read by adding voice recordings to his book 'Little Fish'. "I want to show how I can read the words now" - John. John's book has been downloaded over 2,400 times. It was number 2 in free children's books downloads in France last weekend. 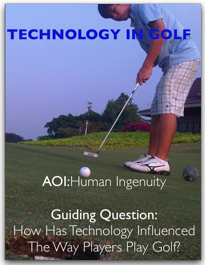 Peter (15 yrs - amateur golfer with handicap of 4) wanted to teach his audience about golf by creating interactive images and instructional videos to enhance his 6 months of research on technology in Golf. "When people saw my iBook - they thought that I had purchased it online. They couldn't believe that I had made it myself. I never thought that I would start my career at aged 15. I now know that I want to be a sports writer." - Peter. This iBook is in the process of being published. Nahyeon (17 yrs) reworked a book that she created over a year ago to be more appealing to a younger audience so she added voice narration to her storybook. She had been unable to publish her book as she thought the only way to publish was via printing, an option that was far too expensive for her to persue. After uploading her book to the Apple iTunes iBookstore, Apple approved it and published it after only 24 hours. "I want to reach as many people as I can with my message about the environment through my artwork. It is my dream to become a book illustrator and now that has come true. I am already working hard on my next book" - Nahyeon. 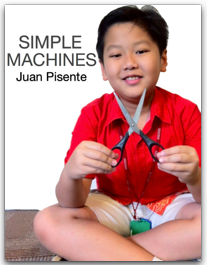 Juan (10 yrs) wanted to teach others about simple machines by including fun quizzes using interactive pictures throughout his book. He wanted people to understand how to identify the simple machines inside everyday machines that are used in our lives by using labels that zoom in on an object in a photo when tapped. He also added 3D images to 'make my book more fun'! "I want people to have fun when they are reading my iBook. I hope that I can teach them about simple machines and that they have fun learning about it." - Juan. This iBook has been uploaded - waiting approval from Apple. Can you see now what it is that I am witnessing? Today was an exciting day for me. 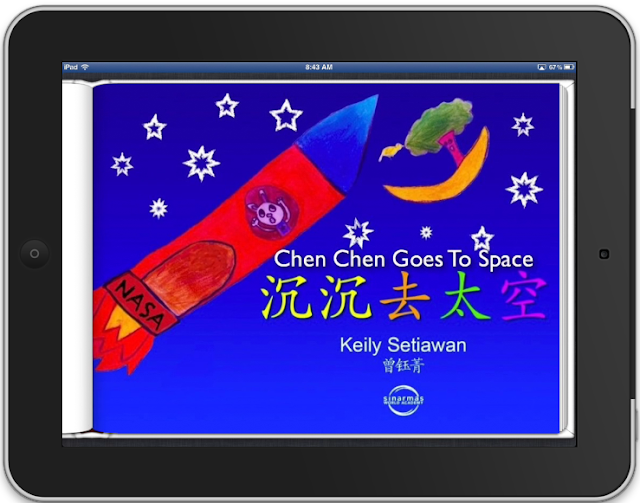 My school hosted a press conference to celebrate the publishing of Keily's book 'Chen Chen Goes to Space' to the iBookstore. 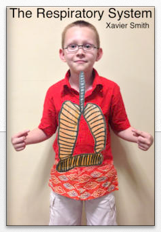 Keily Setiawan is only nine years old and is in Grade 4. I worked with Keily over several weeks in her Mandarin classes to create an iBook. When we first sent it to the iBookstore it was rejected as the iBookstore doesn't support Chinese script. We were so disappointed but Keily suggested to make her book bilingual and add English. I had asked Apple Singapore if there were any books in the iBookstore that were in Chinese and found out that the ones that were there were bilingual. So we revised the book. Actually it made the book become better. 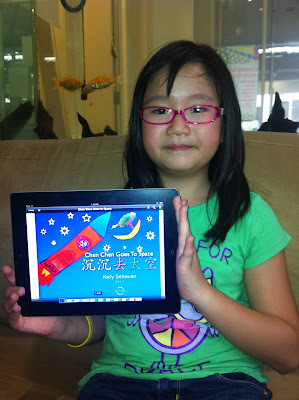 We realize that Keily is probably the first child in the world to publish in English and Chinese. Download Keily's book here. My school sent out an infobyte (newsletter) to the school community to announce Keily's achievement. The next day I was approached by a Grade 11 student. Her name is Nahyeon Kim. Nahyeon is a very talented artist. She told me that she made a book last year for her personal project. This book was hand painted entirely by her. Nahyeon's dream is to become a graphic artist. I persuaded her to add voice recordings to each page to make the book more accessible for young children. On Wednesday we uploaded the book to the iTunes iBookstore. Both students had to ask their parents to come to school to work with me to create iTunes Connect accounts as you need a credit card as a part of the verifying process. Keily is actually under age and Nahyeon doesn't have her own credit card. Late last night I received the news that Nahyeon's book had been published. It was uploaded on Wednesday and published late Thursday night by Apple. That's the fastest I'd ever heard of getting a book published!!! 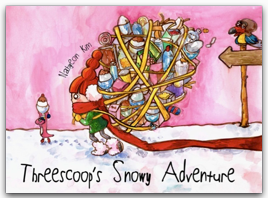 Download her book, 'Threescoop's Snowy Adventure' here. Previously Nahyeon had tried to publish her book. It was too expensive to pay for a print run. She had shared the process on her blog - but that is not the same as being officially published to the world in an online bookstore. Today I presented these books by Keily and Nahyeon and 12 other exemplary books to the press. We had about 30 reporters come to school. Actually I have about 70 books that have been made by students. Today we wanted to show just a short range of books made by students from Kindergarten to Grade 11. Tonight I sit and reflect upon this week of meeting the press and getting books ready for publishing. I remember it was about 4 years ago that I had an interview with The Jakarta Globe. Read the article here. I had met with the Globe having just presented at the 2008 Indonesian Teachers Congress in Jakarta. My presentation was about the power of digital storytelling. I presented entirely in Indonesian. My dream back then was to publish digital stories and have them on a website. The point was to share stories. Sadly it didn't really take off. I have always had a passion for helping students to write and I have created many books over the years with my classes. These are great keepsakes but rarely go beyond the class and parents. In my previous school I actually published a book with my Grade 1 but we only printed 500 copies and that was very, very expensive. Apple has supported me. The software, training and inspiration that I have been given to grow as an educator had changed the way I teach. It's all about the student voice. I realize now, that this was what I was trying to do back in 2008. I was trying to give students a platform, an opportunity to be heard and to have a greater audience to read their work that went beyond the teacher, the class, their parents and even their school community. My students are no longer writing for the teacher, for their parents or for their school community. Students are able to actually publish their work to the world. Keily now realizes that she has an audience on the other side of the globe. Her work is now alongside professional authors in a high profile online bookstore. Keily is now an author! Nahyeon's book that she painstakingly created over a year ago can be downloaded and viewed by people from 32 different countries. Nahyeon is now an author and very talented book illustrator! Yes I know that blogging can give you that international audience. But to have your book published in a forum alongside professional authors is something that is quite amazing. 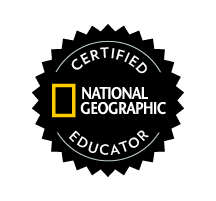 Amazing for me to realize my dream as an educator. This is something that I will continue to build upon. About a week ago, Dan asked me if he could write a press release about my son's book. I agreed on the provisor that he needed to mention that I helped my son to make this book as he is only 5 and not able to type very well yet. The story was picked up by Cult of Mac in the UK. They wrote a great review here. Yesterday I logged into my iTunes Connect account to take a look at the download stats for 'Little Fish'. To my amazement I discovered that the book had been downloaded 1,136 times! I tweeted this to Dan and he said that I should check to see if this book had made it into the Free Books for Children's Literature Lists in the iBookstore. Actually I got the Tweet via my iPhone whilst sitting in Jakarta traffic. 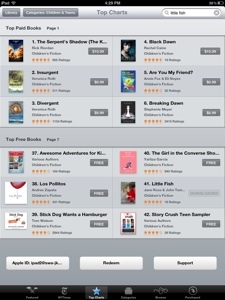 Dan kindly did a check for me (Dan is in the UK) and he found out that my book was number 38 in the US iBookstore. I was so excited!!! Later I was able to check for myself. By that time my book had dropped to number 41 so I took a screen capture to save the moment. Affordable computers have great potential to stimulate creativity and develop excellent problem-solving skills. Thinking about my next Unit of Inquiry. This one is all about Machines. 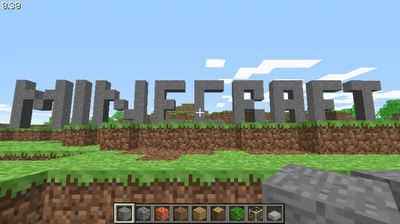 I want to tap into the current craze amongst my Grade 5 students which is Minecraft. 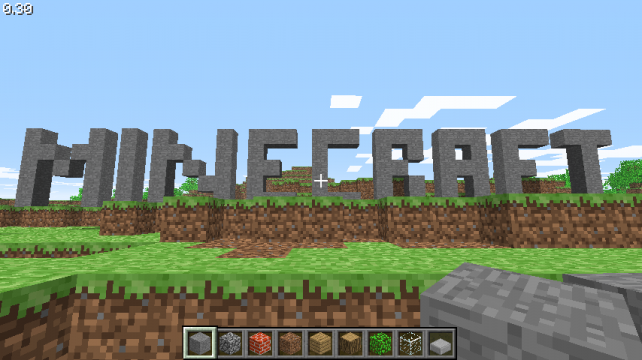 I am thinking that I will get the students to create a roller coaster in Minecraft that doesn't use any power rails and the challenge will be to see how many hills the mine cart can travel over with only the using the motion from down the initial inclined plane. We can measure the height of the slope by counting how many blocks high it is. 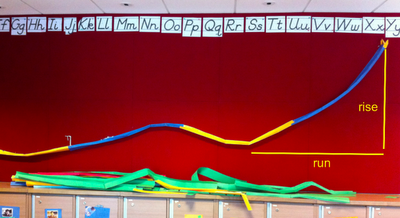 I would then like to translate this into a real live activity by getting the students to create a marble run in the shared area between the classrooms using a flexible hose and marbles of different weights. We could try to compare the two by making a decision based on a scale that one Minecraft block equals so many centimeters. This is based on the height of our roof which would allow a maximum height of 3.5 M. I'm going to try creating a roller coaster tonight in Minecraft that is 35 blocks high to see how far it gets me. Given that Minecraft uses a mine cart and the marble run uses a marble we need to scale it down. Perhaps we could compare the height of a mine cart with a marble to get a better break down? I'll leave those decisions for the students. Here is a great example of what I hope to re-create. For my second hands-on I would like to start by using Angry Birds online to explore a catapult and then get the students to make their own catapults. We will start by throwing soccer balls of different weights to see how far it will go. This we can then compare to using a catapult. Here is a You Tube video of what we hope to create. Actually I am still planning this but I do like to leave certain things open to happen in the moment. I'll certainly post about it when we get started. 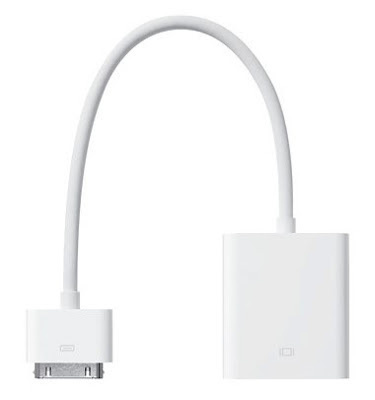 I use iPads a lot in classes but it can be quite difficult for students to project their screen as the VGA connection for iPad sometimes takes a little while to kick in. On the weekend I downloaded a new app for Mac called Reflection. This app is very easy to setup and use. I was easily able to download the trial version which worked straight away on my own home connection. My school uses a Proxy server so I wasn't able to just connect to the system like I can at home. 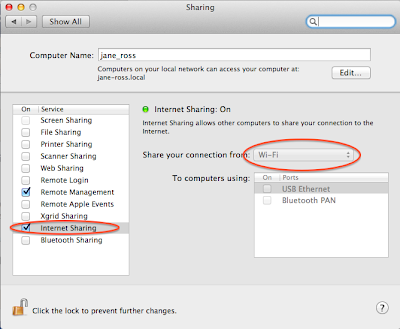 In System Preferences I opened the Internet Sharing option. 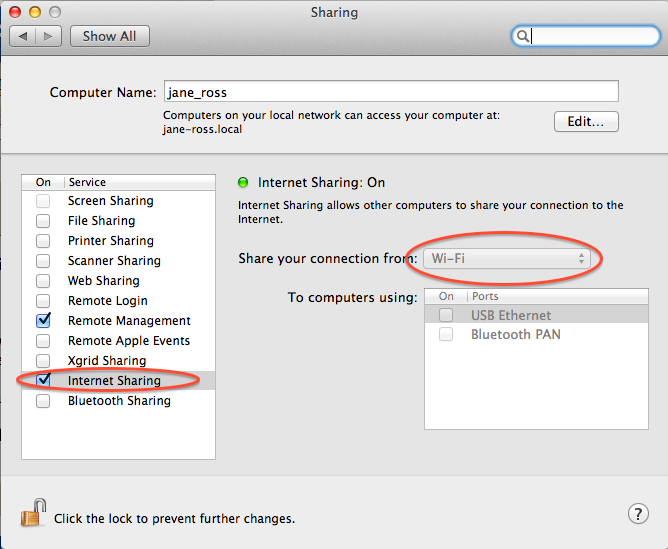 In the Sharing options check the box for Internet Sharing and choose WiFi. This was so I would know which WiFi to join from each iPad. On each iPad I joined the new jane_ross network. After that I was able to double tap my home button on the iPad and swipe to the left to see the AirPlay button. 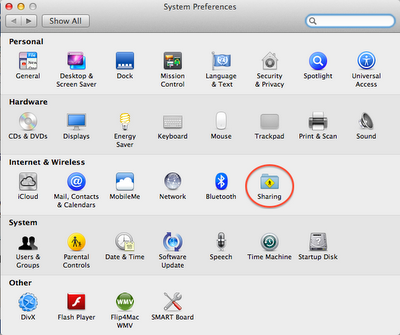 You need to make sure that the Reflection App is active first - or you will not see any AirPlay button. This morning at school I tried it out with 6 iPads at once. Here is the result. It is quite easy to change the size of each iPad by dragging a corner. Technology is continually updating and gadgets that were once the latest thing - are soon replaced by newer ones with more options. So was the fate of the 15 iPod Touch Generation 2 at my school. These iPods are only a couple of years old - but cannot be updated anymore. This is a problem. I can't use the iBooks 2.0 app with iOS 4.2.1. 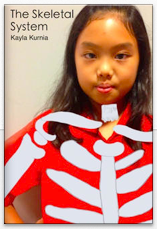 I need the iBooks app to read the books that the students are creating. I am in the middle of a publishing project. As an ICT Coach, I have been working with several classes to create talking books. I went on Twitter - I tweeted about my problem. This is what Twitter is for me. It's my help line for Tech. I think that if I can share as much as I receive then I will have restored the cosmic balance. So I sent out a tweet - an SOS for help. The app creator of Book Creator, Dan Amos @redjumperdan answered my tweet. He suggested that I try using iBooks v 1.2 but it's not easy to get a hold of an earlier version of an iPod app. Most links on the web direct you to the iTunes Store and the most recent version is the one that is available. Where do you find past versions of iPod apps? oldipodapps.com? Dan kindly sent me a copy of the version 1.3.2 but it didn't work with my iPod. What next? I even managed to get a copy of the iBooks .ipa file 1.2.2 but it still didn't work. I love the talking books that my students are making with Dan's awesome Book Creator app but I needed a solution to create more access in the school community for viewing these books. We are creating these books using the school iPads. We have a set of 20 iPad 2 and these iPads can be borrowed by teachers to use with students. In the beginning the iPads were very popular but as time went on they were being borrowed less and less. As an ICT Coach, this is a concern of mine. How can I get the iPads used more? 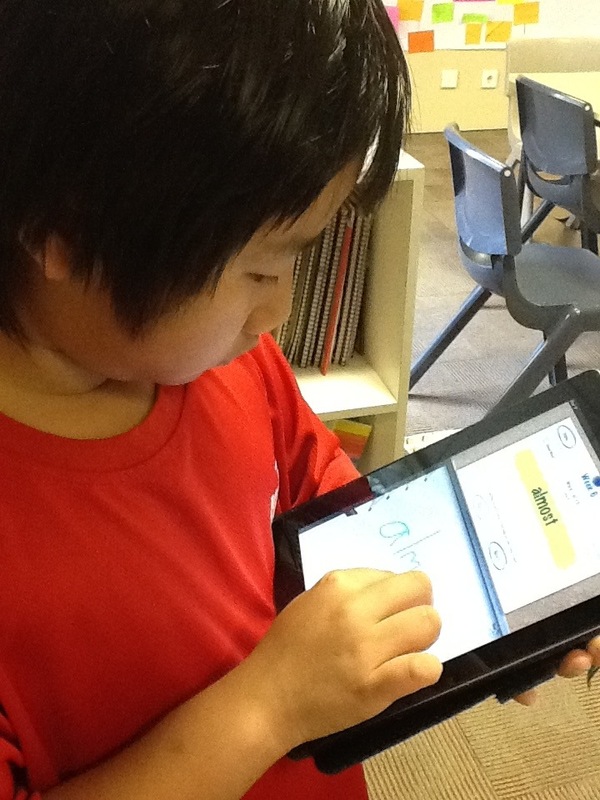 How can I get the class teachers more interested to use iPads in their teaching and learning program? I have taken on this challenge by making a publishing project. I use the Book Creator app to create the book and the Drawing Pad app to create the pictures and as well as this I use photos taken by using the iPad camera. This works really well. We have been creating books in all Grades from 1-5. I have been working very closely with the Chinese teachers in the school as by using the Pinyin setting in the keyboard, the students are able to type in Chinese characters. 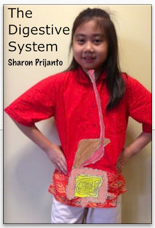 In Indonesian language classes in Grade 1 we have also made several books. Soon Kindergarten will start to create books too. Here are my students working in Chinese classes using the Book Creator app. 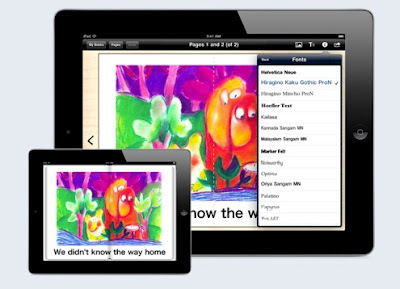 The Book Creator app is so user friendly and allows students to put words, pictures and voice recordings. It produces a book that can be read by the free app iBooks. iBooks works with the iPad, iPhone and iPod Touch. The iPads have become rather popular ... now it's quite difficult to borrow one. This has prompted me to look for other ways of how the students might be able to view each others stories. I am very fortunate to have access to a school Genius Bar aka iQbar. The iQbar is available to anyone in our school community. The guys that work there know a lot about Tech. Today I learned from them about how to jailbreak an iPod 2 using Green Pois0n , load Cydia - then update it, add the AppSync for 4.0+ and sync the iBooks 1.2 that I found online. It's also possible to add a source such as Hackulo.us to download that version of iBooks. Yes! Now all I have to do is get the other iPod Touch jailbroken and set. It means a new life for the iPod Touch Generation 2 in our school. Yesterday when I logged into my account in iTunes Connect, I discovered that my iBook had been released in 32 countries. 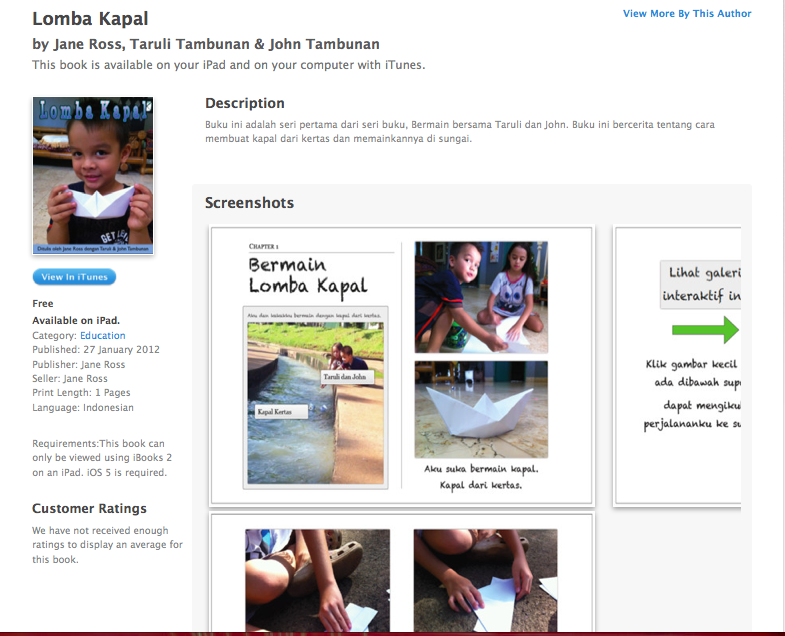 This is my first iBook and I have written it in my second language, Indonesian, with the help of my two children Taruli and John. 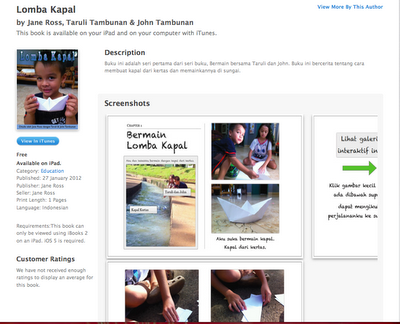 My iBook is called 'Lomba Kapal' which means Boat Race. It is a story about my children racing origami paper boats in the river near my house. I took the photos and videos with my iPhone on the morning that the iBooks Author app was released. I then spent the next two days working on the story and the layout. I was determined to keep the overall size as low as possible. In Indonesia I have a very slow Internet connection at my house. I am well aware that accessibility is the most important factor in technology. I wanted to make my iBook easy to download so that others like me with a slow connection can still get it in a reasonable amount of time. This iBook is just under 18MB and has 15 pages including interactive elements and multimedia. Here is a screen shot inside the iTunes Store of my iBook and the preview pages. I think that it is really sad that my book has been released to 32 countries such as US, UK, Australia, Ireland, Czech Repulic, Estonia and others but it is not available in the Indonesian iBookstore. I asked some of my contacts on Twitter about this. I found out that the iBookstores in Asia do not have any locally produced content in them. I am wondering why this is the case? What has to happen for the iBookstore in each country to be open for locally produced content? What can I do to open the Indonesian iBookstore for locally produced iBooks? I have a group of national Indonesian teachers ready to create children's stories. We need access to the Indonesian iBookstore. In the meantime, my iBook is for free and I encourage you to download it. It includes interactive pictures, galleries and videos. I have been writing children's stories over the years but this is the first time that I have properly published one. I am hoping to write a whole series about the things that we do as a family. 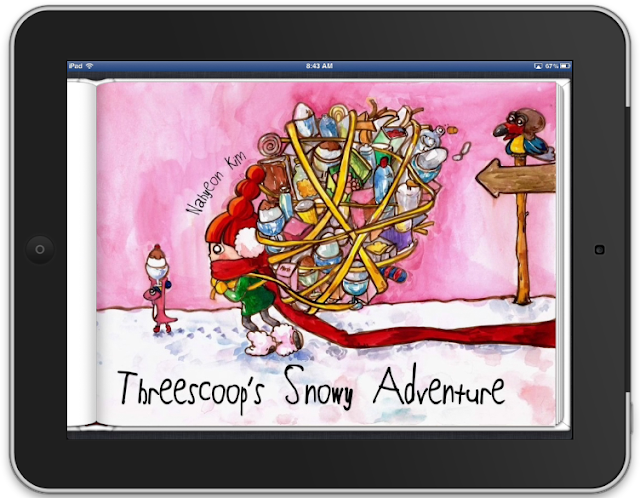 I have blogged about my first attempts to create a storybook using iBooks Author. I was able to create a book of 15 pages over a couple of days. 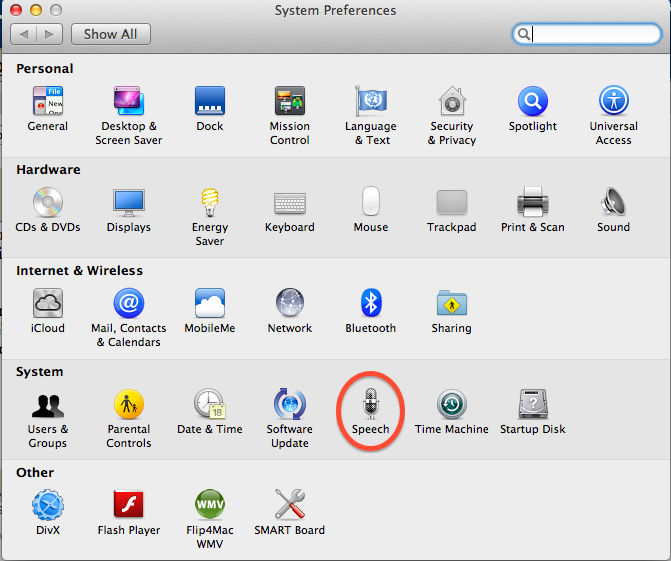 The software is easy to use and feels like a combination between the Mac software Pages and Keynote. My next task after I had completed the book and had it proof-read was to upload it to iTunes Connect. Itunes Connect requires you to download the software iTunes Producer which enables you to upload your iBook and fill out all the necessary information for publishing. My first issue was that one of my interactive picture widgets in my book was not working properly. I didn't realize that the word tags in the picture must always stay within the frame. I was able to fix this fairly quickly but I then needed to wait for iTunes Connect to view my book again. After a few days I sent a message to iTunes Connect to ask what was happening with my iBook. I got an answer within a day. I was told that my book was in the review process and needed to be cleared. Just yesterday I noticed that my book in iTunes Connect was no longer labelled as 'pending' but was now needing a different review process. This review is for quality. I don't know why my book has been singled out for this review. I am wondering perhaps it is because it is in Indonesian and there might not be anyone in iTunes Connect that can check the language? I recently presented a mini workshop about Accessibility in iOS in Bangkok. This is new learning for me. I have had my current iPad 2 for several months and I can't believe that I only just learned that it can read the screen in 36 different built-in languages! This feature works best with iBooks. 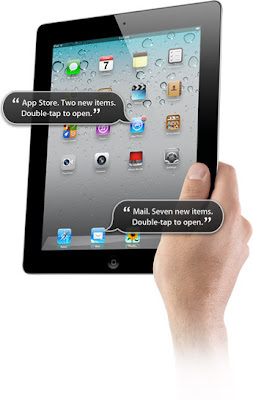 This means that you can get your iPad to read your iBook to you. I have my own iBook that I wrote in Indonesian so I decided to test it. To enable VoiceOver I prefer to use the Triple-click Home method in the Accessibility settings on the iPad. This gives the user greater control to turn the VoiceOver on or off as necessary. 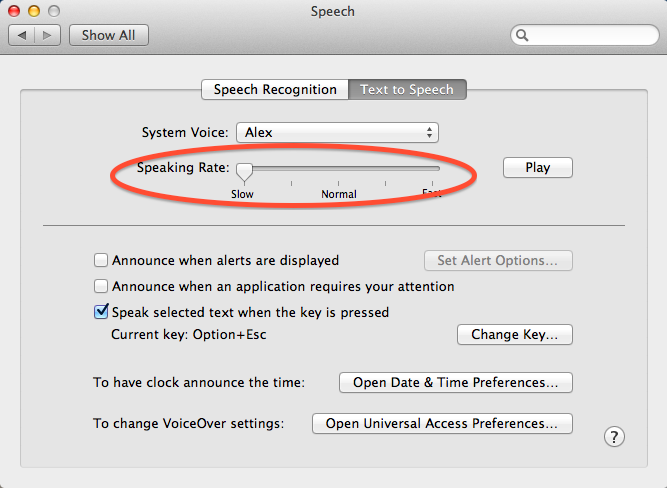 To adjust the speaking rate in the VoiceOver section of the settings slide the setting towards to turtle to make the speech slower. Before you try using the VoiceOver you will also need to select the languages you wish to make available in the Language Rotor. You can select any languages that you will use. You need to select VoiceOver and then inside that tab you select Language Rotor. Next open iBooks and open a book that you would like to have read to you. Open the book to the page that you want read. Enable VoiceOver by tapping quickly three times on the home button. To activate the rotor, tap and hold the screen with two fingers and rotate your fingers. It's a little like turning a dial with two fingers. You will see a dial pop up. You can select the 'language' setting on the dial. To change between languages you tap the screen as if you are making a check mark. You will hear your iPad call out each language. When you get to the one that you want, tap on the text to hear your iPad read the text aloud. I recently presented a mini workshop about Accessibility on OSX. This is something that I previously didn't have much experience with and I am very grateful to Jane Harris for giving me the following suggestions. Jane taught me about reverse spelling. A traditional spelling test is when the teacher reads out a list of words for the students to spell. Jane's idea is to reverse this, to get your Macbook to spell out each word. In Lion, the Macbook has a built in feature for speech. 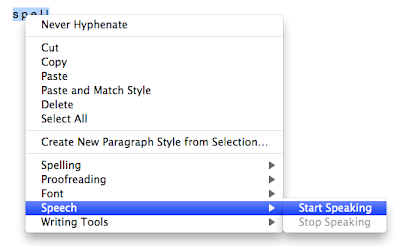 To enable this in Pages you simply highlight the text you want spoken, right click it and select speak. For spelling, just put a space in between each letter - s p e l l . Your macbook will spell the word. You can teach your students to create personal spelling lists and then they can get the Macbook to spell out each word whilst they write it down. 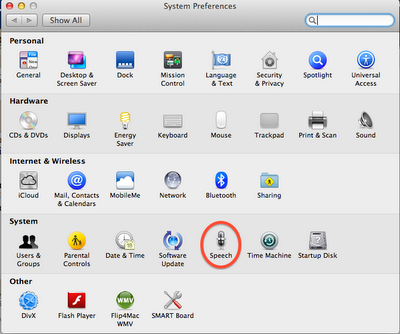 You can adjust the speaking speed in the System Preferences settings in the Speech section. 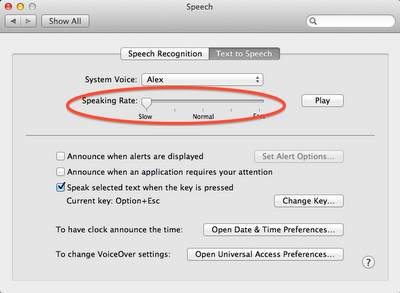 To adjust the speed of the speech you can slide the speaking speed to 'slow'. Another idea is to create slideshows of vocabulary words in iPhoto. 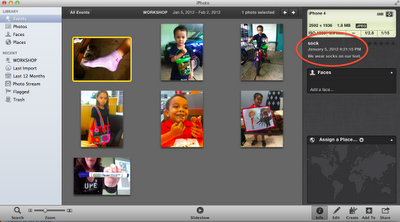 In iPhoto make a folder of images (an Event) and rename each image with the word of the object. 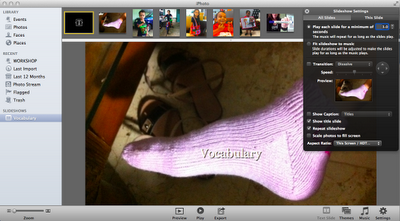 You can also add a description which is a sentence that includes the vocabulary word. 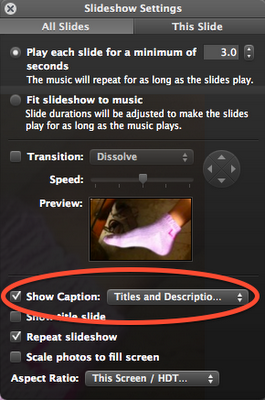 Hold down the shift button to select all images and create a new Slideshow. In the settings make sure that you select 'Show Captions' with Title and Descriptions selected.